Cold Stone Creamery Ikeja City Mall store,will be giving free ice cream and discounts at her three (3) day Grand Opening Ceremony. The event slated for the 17th of April to the 19th of April, is one put together to appreciate existing customers and welcome new ones into a one of a kind ice cream experience. Day 2 (Saturday, 18th April) offers free ice cream for the rest of the year to the first 50 customer to make an ice cream purchase. Other side attractions include, FREE Face Painting and a chance to take pictures with some of your favorite celebrities. 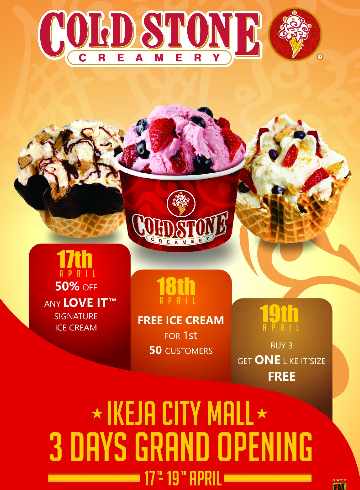 Cold Stone Ikeja City Mall is located at the food court, shop L76.